It was cheap and easy advertising back in another New York, when everybody smoked everywhere—restaurants, bars, parks. And though the businesses on these vintage matchbook covers are long gone, they were going strong when the covers were printed between the 1920s and 1940s. 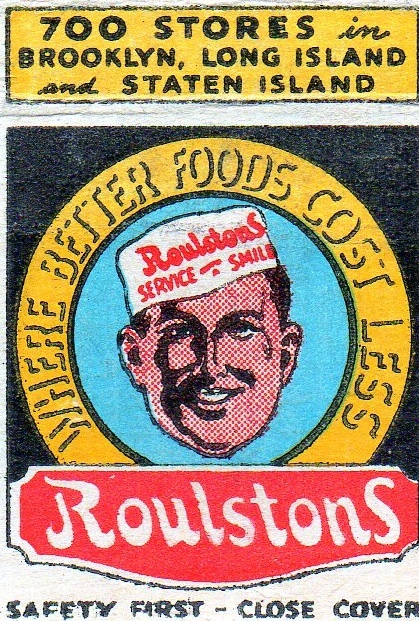 Roulston’s was a grocery store chain headquartered in factory building near the Gowanus Canal. “You should be very proud of your daddy, my mother said. He only finished eighth grade and he is working as a clerk. The reason is his beautiful handwriting. 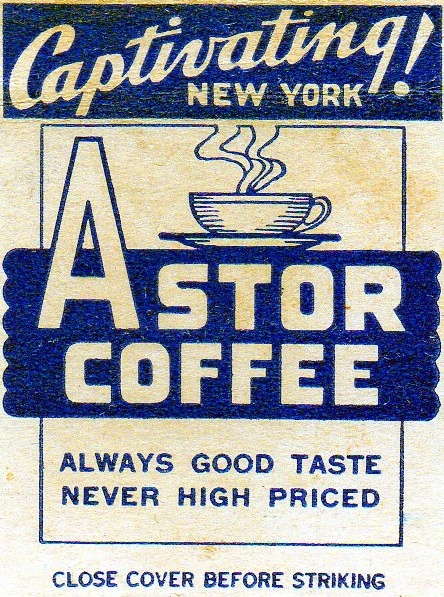 Astor Coffee—I was hoping it was an old-school coffee house on Astor Place, perhaps where the Starbucks is now. Instead, it was the house blend at the gorgeous and grandiose Astor Hotel, late of Times Square, a lovely place to hang in the 1920s. The coffee was so popular they sold it at retail establishments around the city. 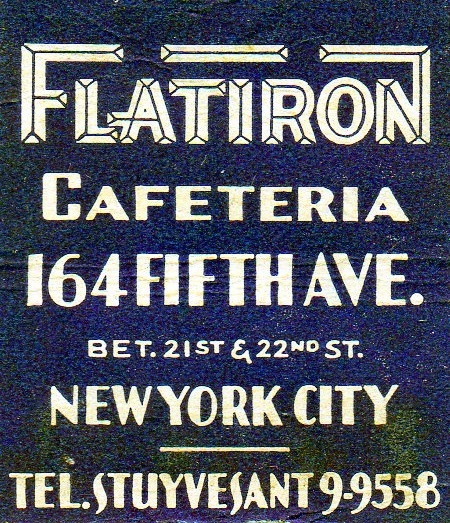 I couldn’t find anything about the Flatiron Cafeteria; I imagine it was just another spot in Depression-era New York to get a cheap cup of coffee and sandwich. But I love the matchbook cover—and of course, the old-school phone number. Today, 164 Fifth Avenue is an Eileen Fisher clothing store. This entry was posted on March 14, 2011 at 4:23 am and is filed under Bars and restaurants, Brooklyn, Fashion and shopping, Flatiron District, Old print ads, Random signage. You can follow any responses to this entry through the RSS 2.0 feed. You can leave a response, or trackback from your own site. Got to this page via a link from VNY. …and if you use the zoom tool you can see 164 peeking in just from the right of the frame (the photo is actually of 162). The letters “FLAT” and “LUN” are visible. Thanks, that’s a great photo! I love the decorative F.